Breitling is the luxury watches brand that is determined to conquer the deepest sides of the ocean by designing exquisite timepieces that are part of a legendary line of diving instruments with high performances, innovative functions and a resolutely sporty look. The name of this series is Superocean and it features a wide range of models created to endure pressure associated with depths of 500 meters (1,650 feet). 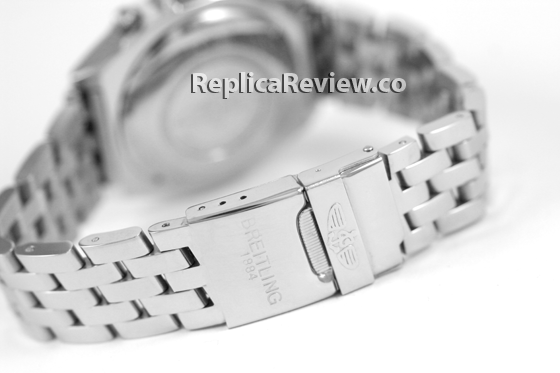 These watches are spectacular in all aspects and they symbolize a new era in the watches industry. 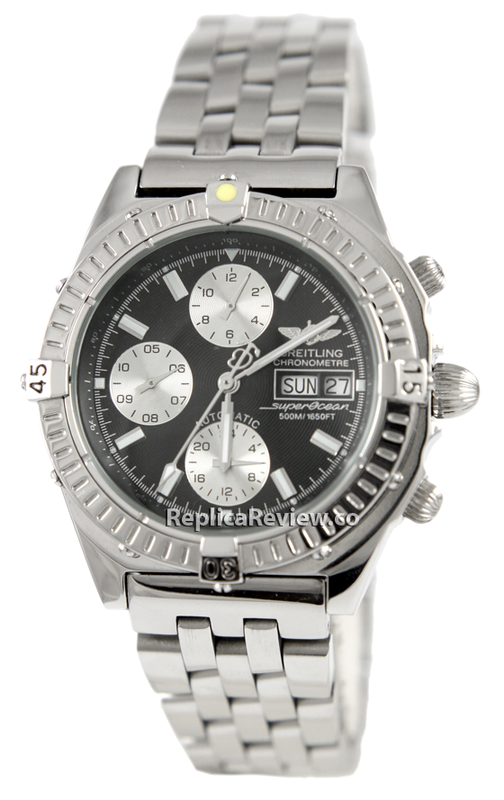 The Breitling Superocean Chronograph is the ultimate diving instrument distinguished by its satin-brushed and polished case, oversized day/date double window and broad ratcheted rotating bezel with black rubber-inlaid numerals and markers. 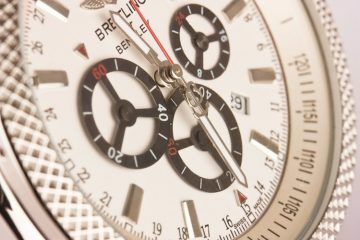 This high end sporty timepiece is powered by a chronometer-certified automatic chronograph movement. Everything about it inspires power, boldness and sophistication. 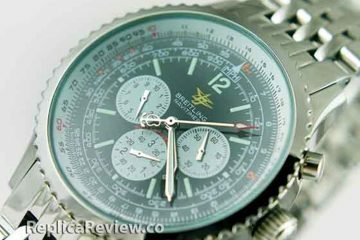 Finding an exact replica of the Breitling Superocean Chronograph may seem like a tricky job if you do not know what to look for, but with the below comparison between the authentic watch and a knockoff you basically have all the essential details for recognizing a perfect imitation right from the first moment. 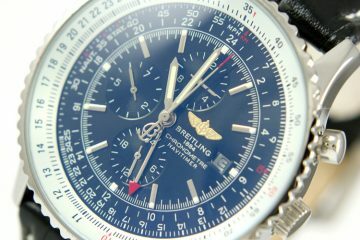 At first sight, the knockoff and the authentic Breitling Superocean Chronograph look pretty much the same, but if you take a closer look you discover a couple of differences. 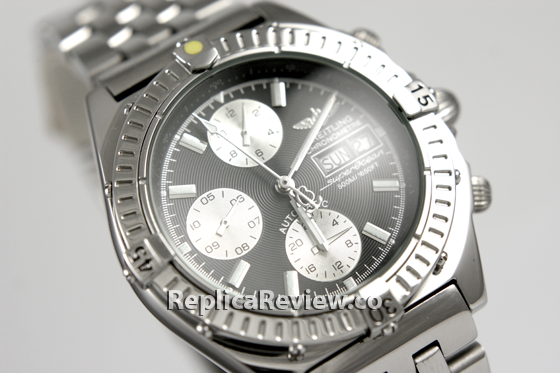 For instance, the chronographs are a little bit off. 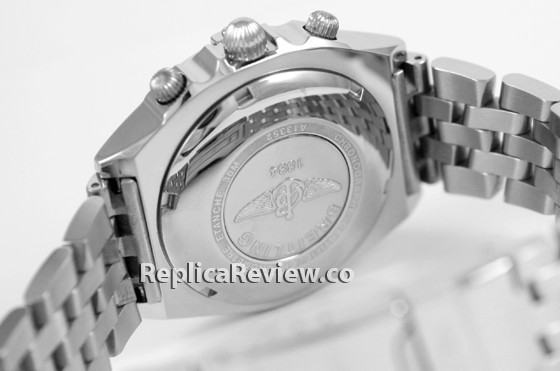 The silver color of the small dials is more shiny and tacky on the imitation watch, plus the markers are less visible than the ones on the original model. The small hands are also in a different color and shape. Oh, and let’s not forget that the markers from the sub-dials are totally off. On the genuine product, the counter from 6 o’clock says 2, 4, 6, 8, 10 and 12, the one from 9 o’clock says 10, 20, 30, 40, 50 and 80 and the one from 12 o’clock says 5, 10, 15, 20, 25 and 30 whereas on the fake it says at 6 o’clock 4, 8, 12, 16, 20 and 24, at 9 o’clock 05, 06, 07, 08, 09 and 10 and at 12 o’clock it says 2, 4, 6, 8, 10 and 12. The hour, minutes and seconds hands are also different. On the real Superocean the hour and minutes hands are split in two luminescent sections and the seconds hand has a red tip while on the replica the hands have a different shape, the hour and minute ones have only one long luminescent coating section and the seconds hand has no red tip. The rest of the dial is the same. 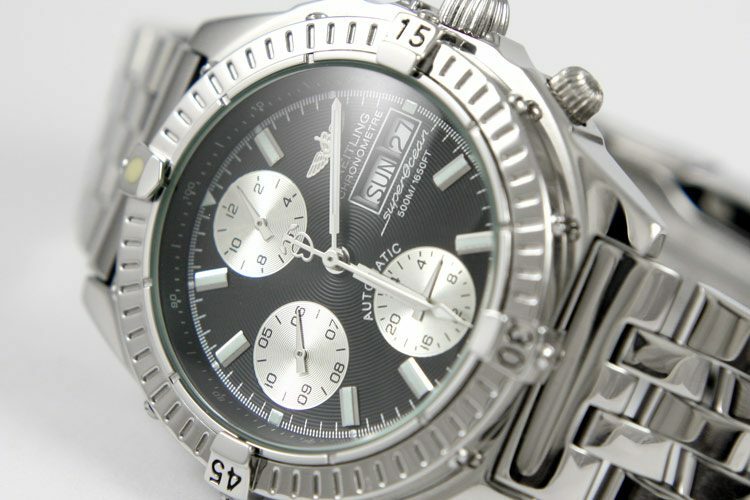 The black dial has a circular raised pattern, the hour and minutes markers are identical, the silver B-winged logo, the date window and lettering as well. 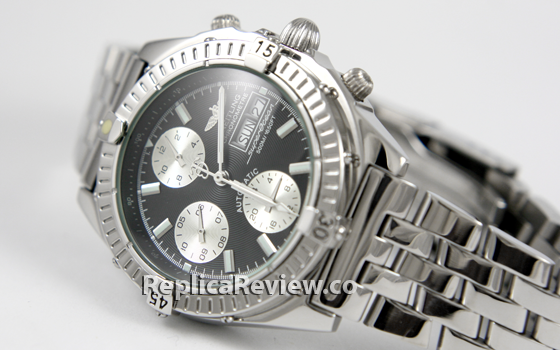 Unfortunately, the bezel is not identical to the real one. 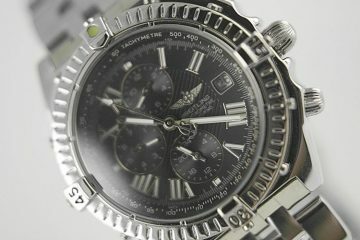 On the authentic watch, the bezel is engraved with numerals, but the fake one has numbers only at the 3, 6 and 9 o’clock positions. The case, winding crown and bracelet seem to be pretty much the same. The automatic mechanism is another thing you should check. 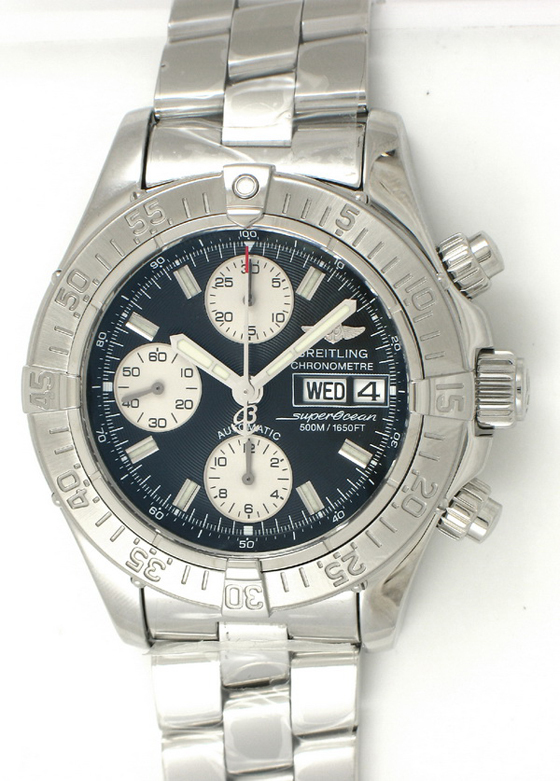 A good quality chronograph watch should have a 25 jewels Swiss ETA automatic movement in order to offer fully functional small dials. The Breitling Superocean Chronograph is a remarkable diving instrument that features an exquisitely modern and sporty design. 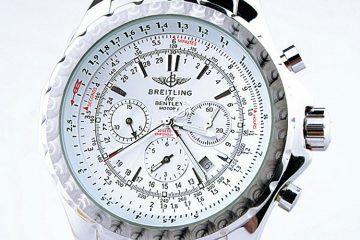 If you are a fan of this model then simply follow the above guidelines to buy yourself a high quality imitation timepiece.